Trans Mountain existing assets valued at $550 million in 2007. Finance Minister Bill Morneau has proposed sacrificing Canadian taxpayers to bail out an uneconomic U.S. pipeline owned by former Enron executives. This is an opportunity for new journalists to examine BC’s historic referendum on electoral reform. And the bill for taxpayers won’t be $4.5 billion as Morneau claims, but much closer to $20 billion, says economist Robyn Allan. Let’s parse the fantastic numbers, because they will affect all of us. The $4.5-billion purchase price only buys a leaking 65-year-old pipeline, an aging tanker farm not built to withstand earthquakes, and a port facility as well as engineering plans and permits for the twinning of a high-risk expansion project. In 2007, Kinder Morgan reported to the National Energy Board that it valued the Trans Mountain pipeline system at $550 million. Let’s repeat that fact: the federal government will pay $4.5 billion for an old and compromised tanker and pipeline system that the company valued at $550 million in 2007. “The federal government have overpaid for an aging asset that has huge integrity problems. Every year they have to spend more on maintenance to keep it running,” added Allan. Next, taxpayers are on the hook for the cost of twinning the project — an estimated $7.4 billion and climbing. Given the iron law of megaprojects (overbudget and over schedule over and over again), Allan expects the final construction bill to be more than $9 billion. Then you have $2.1 billion in financial assurance that the government will have to put up for land-based spills. According to the Pipeline Safety Act, $1 billion in financial assurances for the existing pipeline was in place based on a $500-million parental guarantee from Kinder Morgan. As a condition of the pipeline expansion the federal government has required another $1.1 billion. Taxpayers will also be responsible for $1.5 billion for the so-called ocean protection plan — every five years. “In the end the federal government is looking at a $15- to $20-billion bill for taxpayers,” concluded Allan. Allan, a former business executive who has studied the project’s poor economics for seven years, suspects that bitumen shippers using the Trans Mountain expansion project will soon ask the government for lower tolls, and thereby increase the burden on taxpayers even more. But the story gets worse for Canadian taxpayers. The International Marine Organization has announced plans to limit sulphur in bunker fuel by 2020. Bunker fuel is sourced from heavy oil. Even the Canadian Energy Research Institute recognizes that this new regulation will have a dramatic impact on bitumen by lowering both the demand for and price of Canada’s heavy crude oil. “Why are we investing in a pipeline when global demand for heavy oil will be diminishing?” asks Allan. If Morneau and Trudeau were really serious about jobs and acting in the national interest, then they would have invested in partial upgrading of bitumen. Every time Canada ships 400,000 barrels of raw bitumen abroad, it exports approximately 18,000 refining and upgrading jobs to other nations. Alberta’s tarry bitumen, which will always sell at a discount due to its poor quality, can’t move through a pipeline without being diluted with costly imported light oils or fracked natural gas liquids from B.C. or the United States. The more raw bitumen Alberta mines, the more pipelines it needs and the more diluent it must import to move that raw bitumen. Alberta now produces about 2.3 million barrels of raw bitumen a day but only 40 per cent is actually upgraded or refined into easily pipeable products such as synthetic crude, gasoline or jet fuel. If the federal government took just $9 billion from its proposed $20-billion bailout for Kinder Morgan, it could fund three partial upgraders in Alberta capable of upgrading 300,000 barrels of bitumen a day. According to the University of Calgary’s School of Public Policy, just one partial 100,000-barrel upgrader alone would increase the value of bitumen by $10 to $15 per barrel, end the need for diluent, free up pipeline capacity, and boost Alberta’s GDP by $505 million. But partial upgrading was never on the national table for discussion, and isn’t that a startling omission. Kinder Morgan, which could no longer afford the $7.4-billion project, took advantage of a bitumen republic that foolishly proclaimed an unneeded pipeline a matter of “national interest” without so much as a risk analysis or simple cost benefit report. The only studies that say the Trans Mountain pipeline will make money for the Canadian economy are reports paid for by Kinder Morgan. Critics including Allan have described these biased reports as fraudulent. What kind of a stupid nation buys a leaky pipeline from a bunch of good old Texas boys without doing any due diligence? 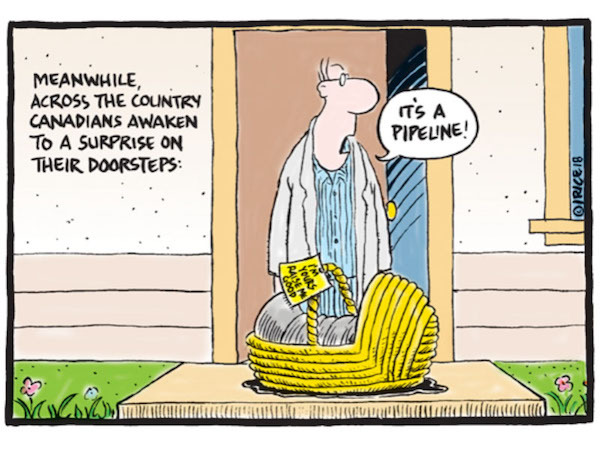 When Canadian taxpayers appreciate the scale of the federal abuse of trust here as well as the government’s blatant corporate welfare for a Texas pipeline company, there will be hell to pay from coast to coast. Andrew Nikiforuk is an award-winning journalist who has been writing about the energy industry for two decades and is a contributing editor to The Tyee. On April 7, he protested at the gates of Kinder Morgan’s worksite as a civic duty. Kinder Morgan did not enforce the injunction that day and there were no arrests due to the presence of Grand Chief Stewart Phillip.